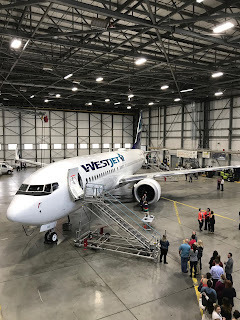 On Wednesday I had the pleasure of attending the unveiling of WestJet's newest aircraft, the Boeing 737 Max 8. Over the past few weeks the Calgary based airline has taken delivery of two of the 50 aircraft they have on order. Fin 302 was on display in one of their hanger bays in Calgary for the media and WestJet employees to walk through and of course be able to take pictures and videos of it as well. Fin 301, was in the next bay over getting ready for the 1st Canadian flight of a Boeing 737 Max aircraft, that is a flight wholly within Canada with passengers on it. The event was mainly attended by employees but also the Calgary media, some of Calgary's best known plane spotters and Rewards Canada! The new plane ushers in the latest technology and services for WestJet and the airline is really excited to be adding the planes into their fleet. While many features that the plane provides are huge for WestJet the recurring theme was the 14% increase in efficiency the plane will provide over the existing next generation fleet. Hopefully the decrease in costs for fuel are passed along in the fares..... ;-). Outside of it being way more efficient, the plane is much quieter! I sat in row 23 behind the engines and can attest to it being significantly quieter than the current 737NG fleet. This will be much appreciated by not only those on board the plane but even those on the ground who aren't fond of planes flying overhead. 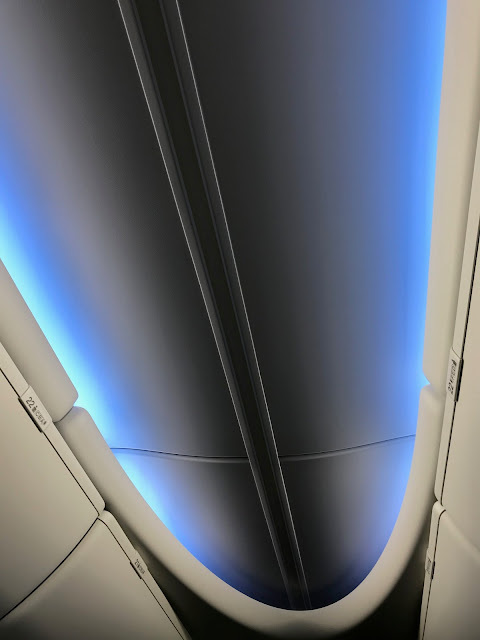 Some other notable changes are the Boeing Sky Interior which boasts LED mood lighting with four different settings (Sunset, sunrise, WestJet Blue & anight time ambient service) and of course the larger overhead bins that on average will allow for 60 more carry on bags to be stored on the aircraft. 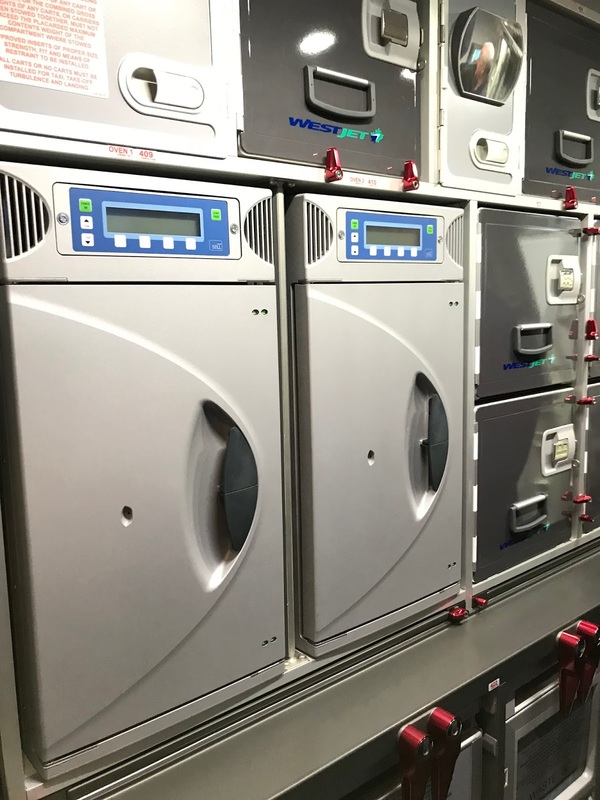 These will also be the first narrow body aircraft in WestJet's fleet to have ovens in the galleys which means hot meal service will be available! 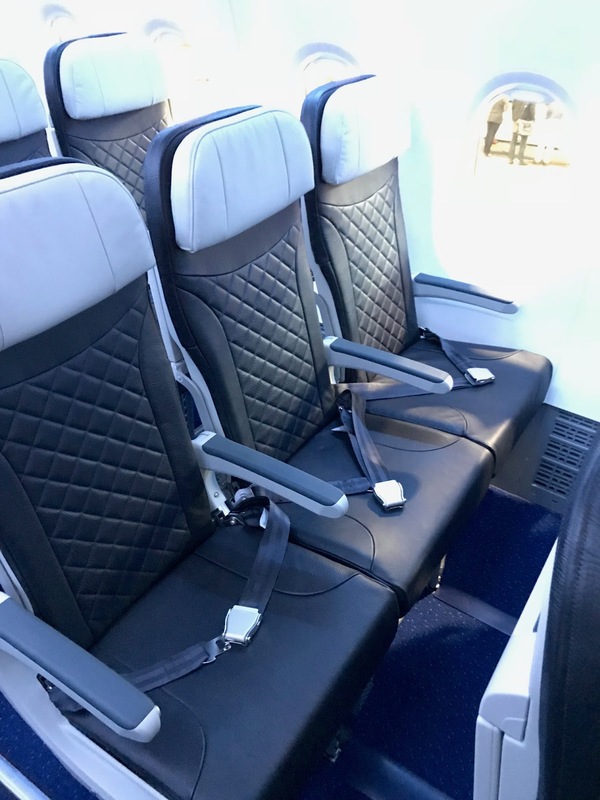 For seating WestJet is moving to hybrid three cabin style. 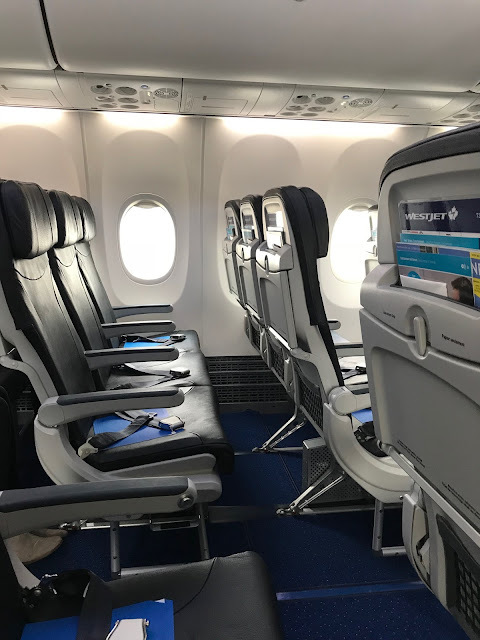 You still only have two main cabins, Plus and Economy but there is also now an Extra Leg Room section at the front of the economy cabin right after plus. You'll know you are in these seats as they have the white headrests but not with 'Plus' embroidered on them. 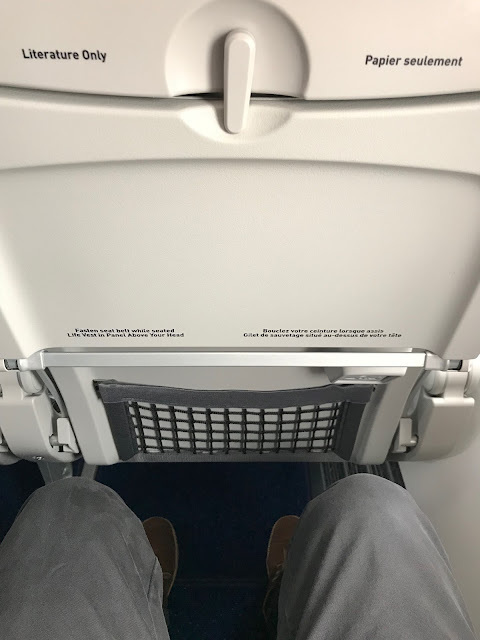 Seat pitch on these MAX aircraft are 34" for Plus and Extra Legroom sections while the rest of Economy will range from 30" to 31". 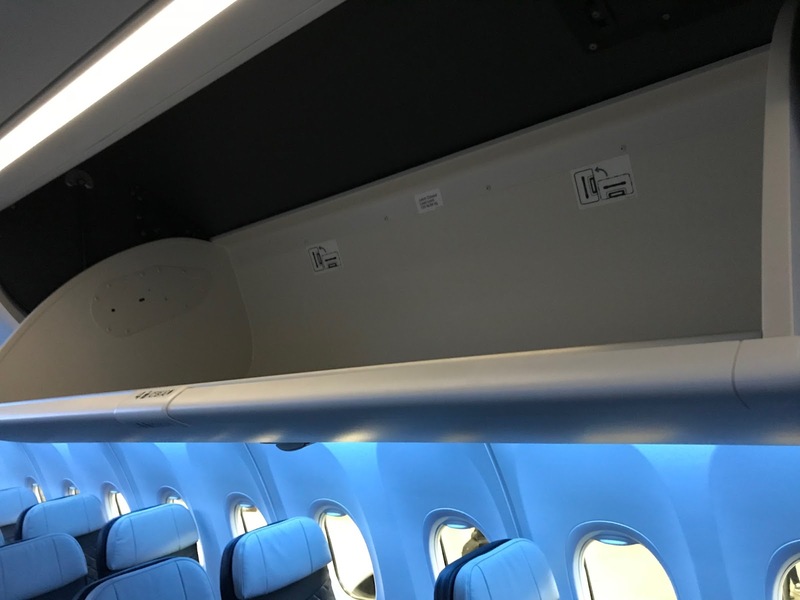 While in the air we were told that Plus will actually be increased to 36" pitch sometime here in the near future to match the rest of the 737 fleet. 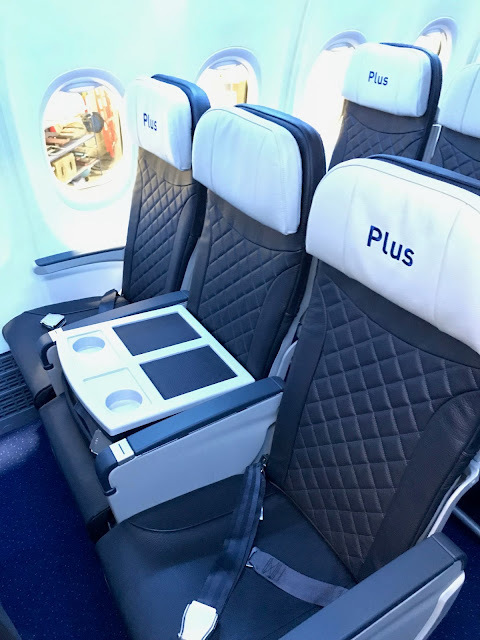 The new seats in Plus and Extra Legroom sections feature a quilted back to further distinguish them from economy. Once through the plane on the media side we boarded fin 301 for the sightseeing flight that took us over the Rockies, unfortunately it was mostly cloudy over most of Southern Alberta and B.C. however the mountains did peak through on occasion. During the flight there were speeches from Gregg Saretsky (WestJet's President & CEO), Boeing's Jeff Edwards and others. There was lots of praise for the aircraft, the WestJet employees and more. Some more details will also revealed on more changes coming to Plus service. 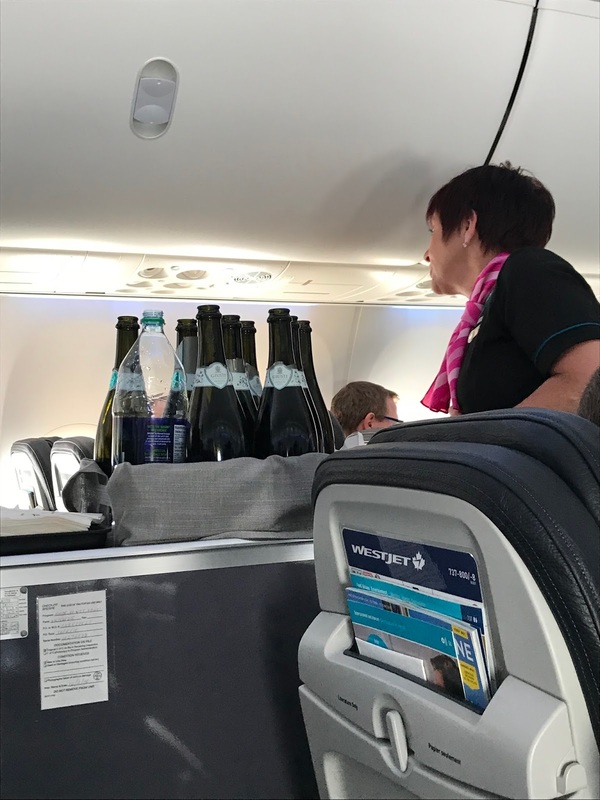 Primarily WestJet is working to add a cabin divider between Plus and Economy and they have set up a partnership with Giusti Wines of Calgary to serve Prosecco out of big bottles to all passengers seated in Plus. Prosecco being served on the flight! It really seems WestJet is ramping up it's higher end service and they need to since they will be offering a full business class on their 787 planes. The better the two integrate the better and smoother it is for the customer. Overall the flight was an awesome experience to have and we have to pass along a big thank you to the WestJet and WestJet Rewards team for allowing me to join them on this special occasion. What follows is a Youtube video compiling some of the photos and videos taken during the event. 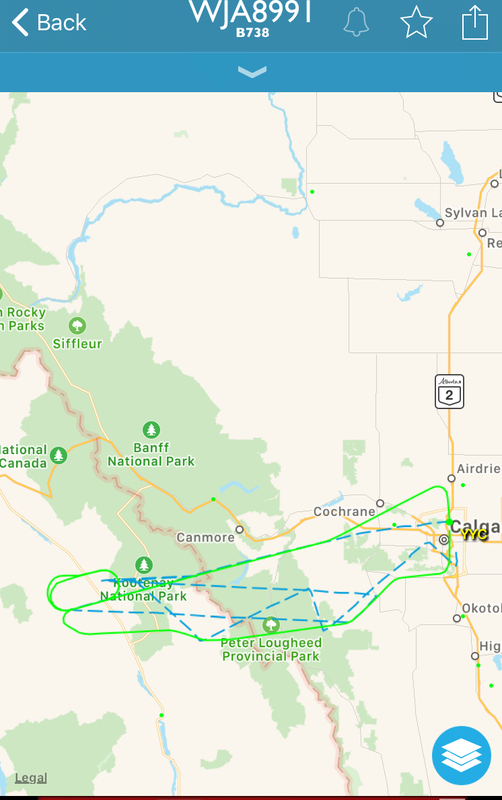 Finally yesterday saw the first commercial flights of the plane (Flights 662 and 667) between Calgary and Toronto. Let us know if you were lucky enough to get on one of those flights and share your thoughts below! 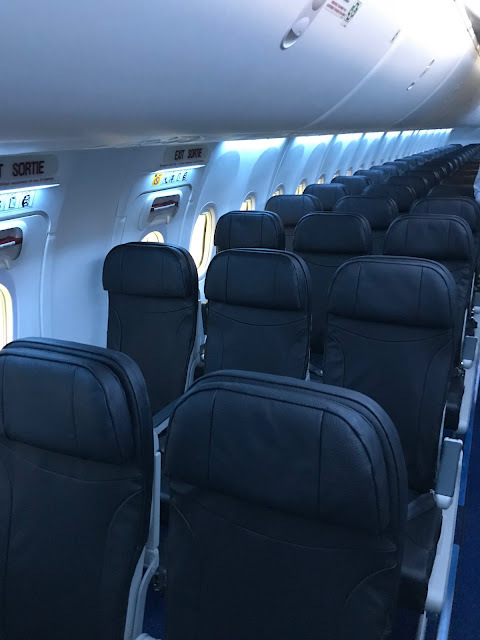 If not, feel free to comment anytime in the future when you do get onto one of the new Max aircraft once they start flying full time on November 9th! Please note that some of the statements we pass along here from WestJet are subject to change!